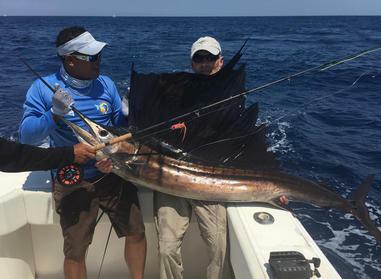 My first ever Sailfish and it was LIT UP and a beautiful fish. 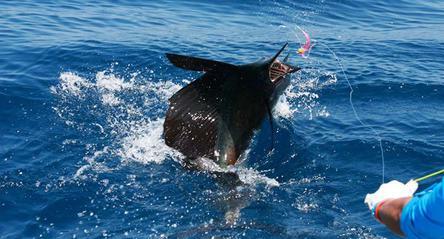 Guatemala November 2014 putting my improved SECOND GENERATION billfish flies to the test. The hooks are bigger with a bigger gape and the bugs are tied bigger to match the hook. The pictures below tell the rest of the story. 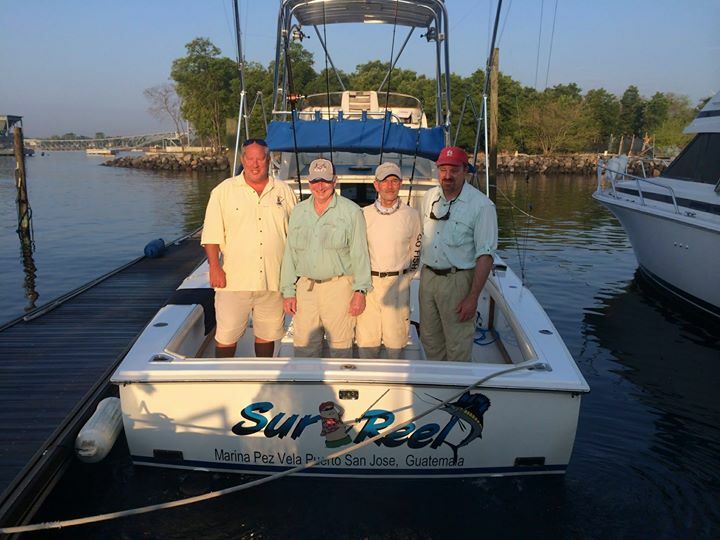 I recently made my second trip to Guatemala to fish with Capt. Eric Goetz with Big Buoy Fishing. My second trip was better than the first and the first was beyond my expectations. I believe Captain Eric is living his dream and makes the same experience available to his clients. As FLY FISHERS we are given the opportunity to truly FLY FISH by the book. We brought up and caught multiple fish every day. On top of that we saw Humpback Whales and were amazed by Spinner Dolphin and Tuna feeding on bait balls. 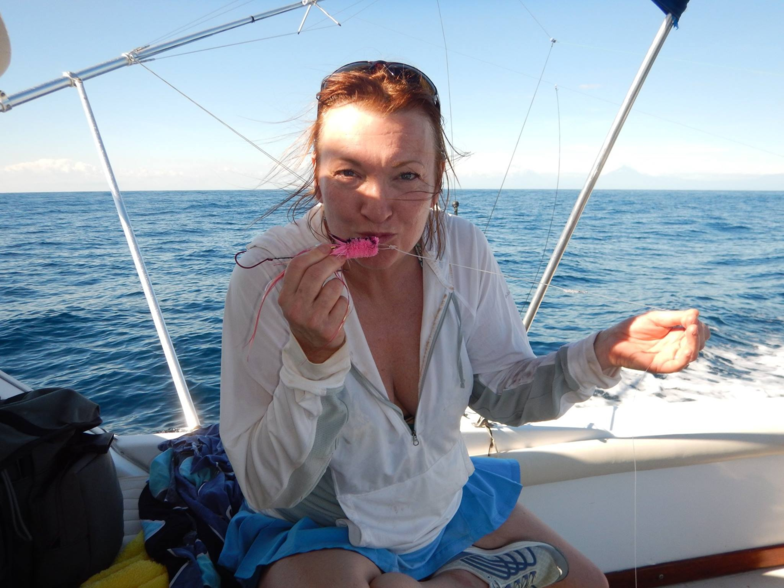 In addition to the sailfish we also caught and dined on,Tuna and Mahi Mahi. We had sushi on the boat and Mahi Mahi sandwiches for lunch and Tuna on the grill for supper. I plan to return. 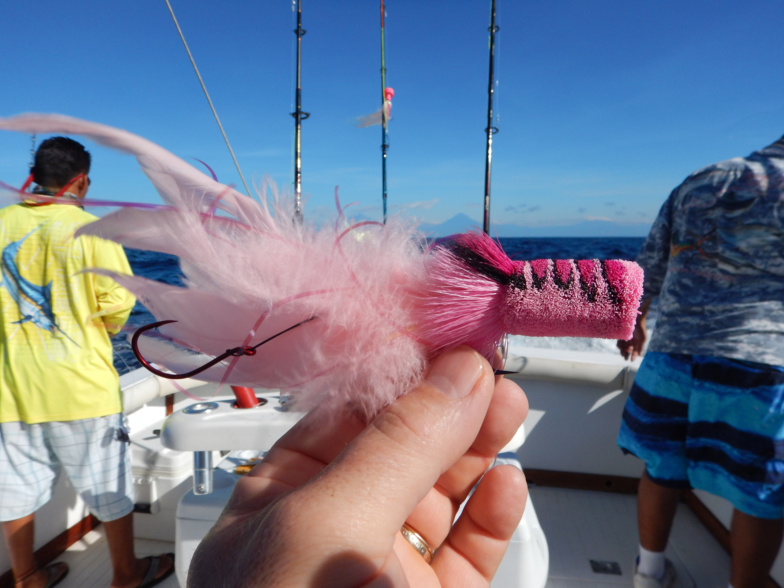 I have improved the quality of the Deer Hair Bill Fish Poppers. The third generation bugs are shown at the bottom of this page. 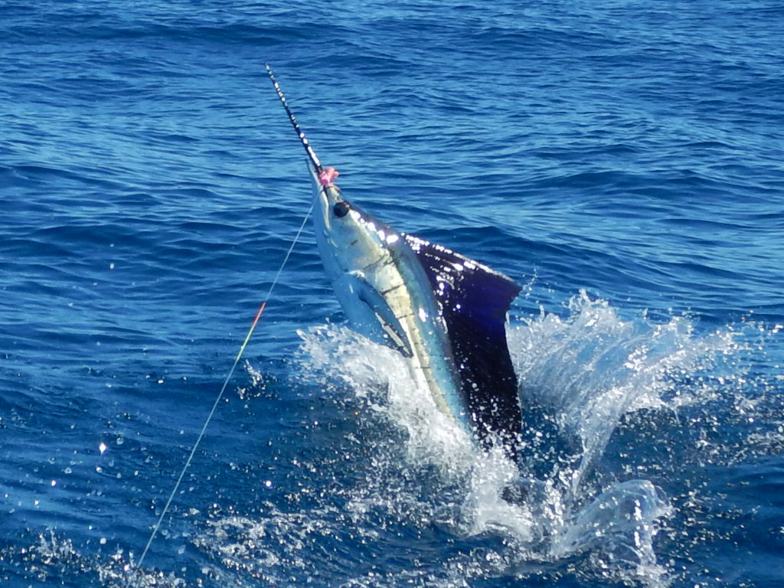 Our two boats raised over 120 sailfish and 1 Blue marlin in three days. 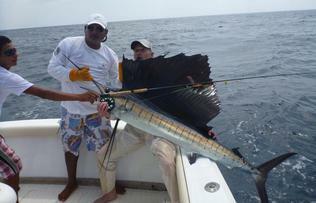 We caught and released 19 Sail fish on fly rods and several more on bait tackle or spin tackle gear. More fish related photos to come ( I hope) . If I can figure out how to do video I will do that also. I am using my "Big Eye" technique that is demonstrated in "THE NEXT LEVEL" DVD to add eyes to the bugs. The hooks have been updated and the technique I use to attach the stinger hook is improved allowing me to tie a tighter bug that simply will not slip no matter what. 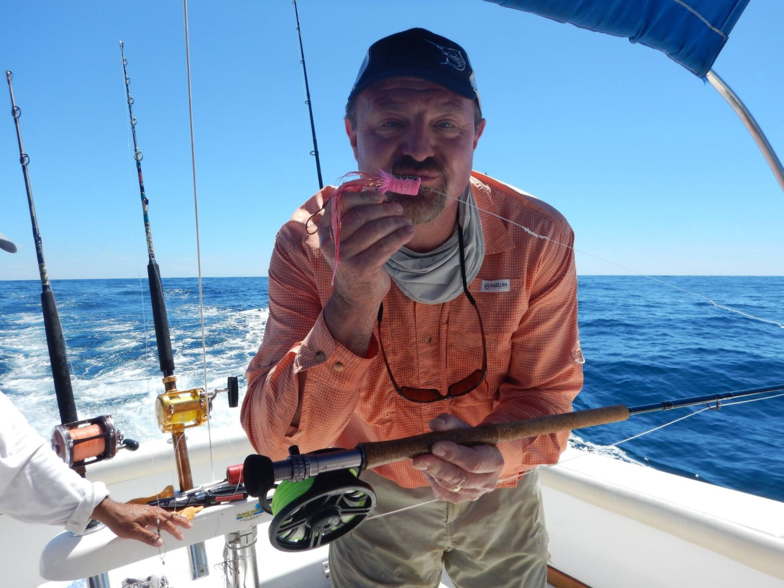 Captain Eric Goetz has credited one fly with being able to catch up to 25 fish before being retired! I now have that fly. This is Shawn Taylor, who has made it his life's goal to make me a better fisherman. I do not think he knew what he was getting into, but it really has been fun! 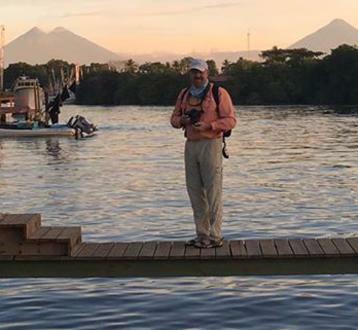 This picture was taken in Guatemala 2016 with three active volcanos in the background. MAHI MAHI or DOLPHINFISH or DORADO or DOLPHIN . MAKES A GREAT SANDWICH. 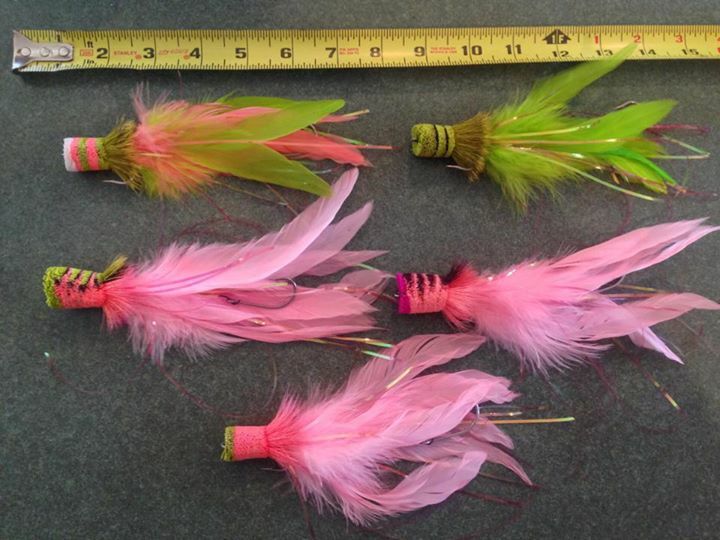 FOURTH GENERATION BILL FISH FLIES. These are tied on a Partridge Sea Beast #6/0 hook. The stinger hook is an Owner SSW 5311-151 5/0. It is attached with a 70 Lb Titanium Leader wire that is attached thru the eye of the base hook. I do tie these with 200 Denier Gel Spun Thread for strength. I use my own techniques as demonstrated in the videos. I tie one bunch (BIG) on the bottom and one bunch (BIG) on the top and pack the hair with my fingers. The basic techniques are demonstrated in the first DVD. The eye patterns are demonstrated in the NEXT LEVEL DVD. BILLFISH FLY BEFORE TRIMMING AND AFTER TRIMMING. NOTE CORK ON TRAILOR HOOK!